Lumber Liquidators Services of Toano, Va., is recalling about 22,700 5-gallon mixing buckets. Young children can fall into buckets and drown. The buckets do not have the required cautionary label warning of the drowning risk posed to young children. 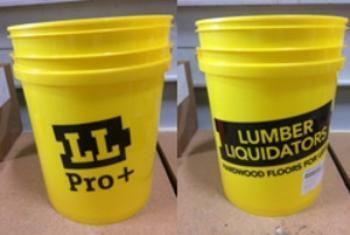 This recall involves a 5-gallon yellow plastic mixing bucket with LL Pro+ and Lumber Liquidators printed on the outside of the buckets. The buckets have the SKU #10043866 printed on the product label. The buckets, manufactured in China, were sold at Lumber Liquidators stores nationwide and online at www.lumberliquidators.com from June 2018, through August 2018, for about $3. Consumers may contact Lumber Liquidators at (800) 366-4204 from 8 a.m. to 8 p.m. (ET) Monday through Friday 9 a.m. to 6 p.m. (ET) Saturday; and 11 a.m. to 6 p.m. (ET) Sunday, or online at www.lumberliquidators.com and click on Quality Commitment at the bottom of the page for more information.